Even Imogen Poots can't quite save it. 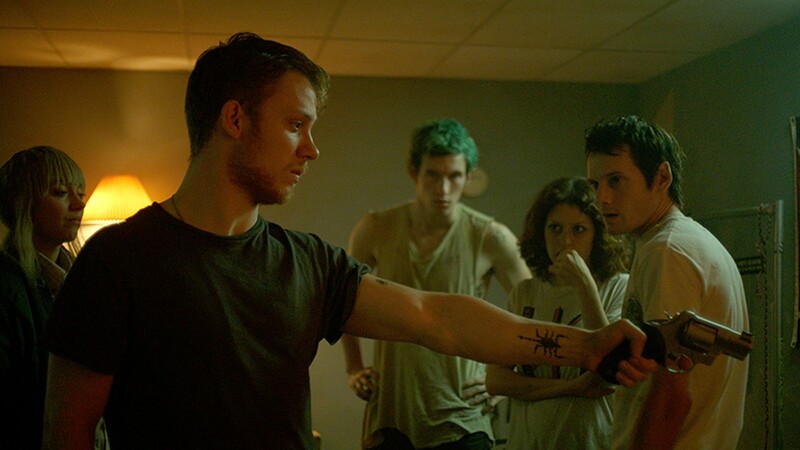 Imogen Poots, Joe Cole, Callum Turner, Alia Shawkat, and Anton Yelchin (L to R) in Green Room. Written and directed by Jeremy Saulnier. With Patrick Stewart and Imogen Poots. Now playing. A touring punk-rock band gets booked into a white supremacist dance hall deep in the Oregon woods. One of the band members barges into the green room just in time to witness the aftermath of a murder. So, the neo-Nazis hold the punk-rockers in the room under the pretense of "waiting for the police," with the intention of killing them once they emerge. The would-be victims choose to resist. Cue yelling, pit bull, shotgun, box cutter, flesh wounds, etc. 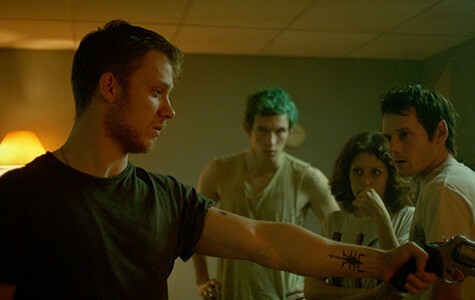 That's the complete plot of Green Room, the latest from Jeremy Saulnier, whose eerie character study Blue Ruin was one of the best surprises of 2013. That film — written and directed by cinematographer-turned-filmmaker Saulnier — had suspenseful plot turns and small, meaningful oddities to go along with the sudden violence. There is very little that's surprising about Green Room, except how the same director could get so dumb, so quickly. Throughout, innocent questions arise. For instance: Star Anton Yelchin does not belong in a punk band — he's too clean-cut and mild-mannered, far better as a novelist (5 to 7) or a Star Trek regular. Then, explain to us how a none-too-bright, none-too-successful band from Alexandria, Virginia is gigging in the Pacific Northwest, 2,800 miles from home. The Aryan cult members, led by soft-spoken but ice-cold Darcy (Patrick Stewart, in a sleepwalk performance), are almost as clumsy as the punks. How do you cover up one murder by killing another five people? (Darcy's nutsy flunkies seem well-drilled at this sort of thing; does it happen all the time?) Scenarios like this usually take place in Flyover Land, not End-Up Land. Perhaps Green Room is part of a conspiracy to keep gullible California slackers from moving up the coast. But those nagging inconsistencies take a back seat when the bones begin to snap. The sneak preview audience at the brew-and-movie house where I saw Green Room was well oiled with craft beer and in no mood to quibble about why who did what. Clueless college students/punk rockers in slasher flicks always need uncouth backwoods types to skirmish with, so why not use white supremacists? When we get down to it, Imogen Poots' flaxen-haired character Amber could have saved the movie, if they had ditched Yelchin and let her lead the revolt. Macon Blair, from Blue Ruin, is also good as one of Darcy's less reliable storm troopers. (Maybe make the Nazis fruitier and less mumblecore.) Still, Green Room looks hastily written, if carefully produced. We suspect, we hope, that Saulnier has better projects up his sleeve. Until then, this triumph of the swill may make a useful time waster for the easily amused.